What was once the sick man of Asia now brims with vitality. When we secured our first positive credit rating action, some said it was pure luck. Now that we have had eight, can it still just be luck? When the Philippine Stock Exchange Index first broke 4,000, many wondered if that was sustainable. But now, with so many record highs, we are having trouble keeping score: For the record, we have had 44, and the index hovers near or above 5,000. In the first quarter of 2012, our GDP grew by 6.4 percent, much higher than projected, the highest growth in the Southeast Asian region, and the second only to China in the whole of Asia. Once, we were the debtors; now, we are the creditors, clearly no laughing matter. Until recently, we had to beg for investments; now, investors flock to us. Some Japanese companies have said to us, “Maybe you’d like to take a look at us. We’re not the cheapest but we’re number one in technology.” A British banker recently came loooking for opportunities. And we are building an environment where progress can be felt by the majority. When we began office, there were 760,357 household-beneficiaries of the Pantawid Pamilyang Pilipino Program. Our target: 3.1 million within two years. By February of this year, the three millionth household-beneficiary of Pantawid Pamilya had been registered. Next year, we will enroll 3.8 million—five times what we had at the beginning of our term. For example: Last year, I told you about our anti-dengue mosquito traps. It is too early to claim total victory, but the initial results have been very encouraging. This project is in its initial stages. But even this early on, we must thank Secretaries Ike Ona of DOH and Mario Montejo of DOST; may our gratitude spur them into even more intensive research and collaboration. I have great faith in Secretary Luistro: Before the next year ends, we will have built the 66,800 classrooms needed to fill up the shortage we inherited. The 2,573,212 backlog in chairs that we were bequeathed will be addressed before 2012 ends. This year, too, will see the eradication of the backlog of 61.7 million textbooks—and we will finally achieve the one-to-one ratio of books to students. Year after year, our budget for education has increased. The budget we inherited for DepEd last 2010 was 177 billion pesos. Our proposal for 2013: 292.7 billion pesos. In 2010, our SUCs were allocated a budget of 21.03 billion pesos. Since then, we have annually raised this allocation; for next year, we have proposed to set aside 34.99 billion pesos of our budget for SUCs. Despite this, some militant groups are still cutting classes to protest what they claim is a cut in SUC budgets. It’s this simple: 292.7 is higher than 177, and 34.99 is higher than 21.03. Should anyone again claim that we cut the education budget, we’ll urge your schools to hold remedial math classes. Please attend. I repeat: what was once impossible is now possible. I stand before you today and tell you: this is not my SONA. You made this happen. This is the SONA of the Filipino nation. CHICAGO (jGLi) – The last time I went sea swimming was in 2005 when I accepted an invitation from Filipino American lawyer and businesswoman Loida Nicolas Lewis, my kababayan (town mate) from Sorsogon City in the Philippines, to go swimming among the Butandings, white-spotted monster but gentle whale sharks, frequenting the mouth of Donsol Bay, part of the Sorsogon Bay and what is now known as Philippine Western Sea (formerly South China Sea). It was also a homecoming for me as Donsol is my birthplace and two of my other siblings – my elder sister, Gregory, who died at the age of six after being run over on Aug. 18, 1952 by a bicycle driven by a hit-and-run cyclist named David Ricafort, and my younger brother, Ramon, who shortened his name into Ray when he became a U.S. Citizen. Joining that trip were Loida’s younger sister, Mely Nicolas, now Secretary of Commission on Filipinos Overseas, who will be one of the guests at 2012 NaFFAA’s 10th National Empowerment Conference in Detroit, Michigan on Aug. 2-5, 2012, and Loida’s youngest sibling, Pastor Francis Nicolas, and my kababayan from neighboring Albay province and fellow Chicago resident, Marlon L. Pecson, and others. But last Monday, July 9th, I went swimming again by the sea. This time by the shore of Imperial Beach, a residential beach city in San Diego County, California, with a population of 26,324 (2010 census). The city is the most southern beach city in Southern California and the West Coast of the United States. It is in the South Bay area of San Diego County, 14.1 miles south of downtown San Diego and 5 miles northwest of downtown Tijuana, Mexico. The shore is part of the expansive Pacific Ocean. It does not have the inviting Butandings but its sizable waves were irresistible for me as they reminded me of the Pacific Ocean waters in far-off Matnog, Sorsogon, the birthplace of my mom, Consolacion G. Garra. Like Matnog’s waves that slap into the shore that create the ear-splitting sounds, where the town got its name for “Matonog” (loud sound), Imperial Beach’s waves were so alluring that even if the cold westerly winds were whipping my front and my back with piercing cold winds, I still dipped into the waters and ventured into the deeper part, where waves had not peaked before breaking into micro-bubbles that lash the sea shores. This time I rode the waves with a surfboard that I could only paddle but not stand on. Although, I still took on water, my reunion with the waves was electric that blew my mind. My nephew, Rico Villamor, suggested that we also harvest some clams (sea shells) that we can collect by pushing our two bare feet deeper into the knee-deep sands while we twist our feet. In combing the beach, if we felt something as hard as a stone, there was a likelihood that we stepped on a clam, which we can collect up to the maximum of six. Of course, there was no way that we could reach the limit ourselves as we came up empty-handed. Unlike in massive Sorsogon Bay shores, seashells could be collected in buckets in just a few hours even in dry but still soft sands. After an hour of swimming, I told Rico’s mom, Violeta L. Villamor, my elder sister, that I was heading to the nearby Imperial Beach pier, where my brother, Ray and Ray’s wife, Angie, were angling for tamban or small milk fish. After an hour of fishing, Ray and Angie, and Rico’s brother, Nino, whispered that they only caught five tambans while a nearby angler was pulling up 2 to 4 tambans every minute. The angler, who looked like a Mexican, appeared to have so mastered the art and science of catching tambans that other anglers, mostly Filipinos, can only shake their heads in disbelief. But it took us an hour or so to figure out how the Mexican caught tambans. If one had stared long enough into the wavy waters 40 feet below, he could spot a school of tambans moving in groups. All one had to do to catch them was to throw his hook, line and sinker in the middle of tambans and pull it up and release it a little bit. Sooner or later, a tamban or two or sometimes three and four would race to nibble at several hooks tied to small colorful feather-like “jigs” that served as “baits” and the tambans would be pulling his line away. By pulling his line up gingerly but firmly so that the tamban/s could not get away, one could easily load the tamban/s safely into the waiting container. One can also catch a variety of other fishes but they are few and far between. After a few hours when sun started to disappear from the horizon, we ran out of container and we headed home. It was a reunion of sorts for the relatives and friends of the young Villamor family, whose patriarch, Jose Grones Villamor of Sorsogon and Imperial Beach cities, died of lung cancer on July 1st at the age of 72. We were there to pay our last respects to Joe Villamor, my brother-in-law, at his funeral services last Saturday, July 7th, at the National City and Chula Vista Mortuary and Cremation Service at 611 Highland Avenue. Those of us from Chicago, including Ray, Angie, our eldest sister, Tonie L. Rey, were there to extend our moral support to a grieving family member. Our other sister, Dr. Dona L. Hernandez, like, Tonie, who paid a visit a month ago to Joe Villamor before he died of lung cancer, decided to stay put in Chicago. But Dona would be offering a requiem mass for Joe at the 10:30 a.m. mass on Sunday, July 22nd, at Chicago’s St. Gregory the Great Church. Also on hand at the funeral services were the friends and co-workers of Joe and his children, Onie (Jose L. Villamor), his wife, Cathy and children Joey and Jaye, both girls; Rico, his wife, Evelyn Geraldin, and their children, Gaby (Gabrielle) and Corylene, also both girls; the widow of Melvin, Jennet, and their children Michael and Viola; and Nino and Jesse, the latter two are both in the U.S. Navy. Joe’s cremated remains is going to be brought to Sorsogon City to show it to Joe’s other children, namely, Manuel, Roman and Celeste, and Joe’s grandchildren. What made Joe’s life remarkable and inspirational is that he was able to fulfill his American Dream after just 14 years of immigrating to the U.S. when he was able to convince Nino and Jesse to join the U.S. Navy. CHICAGO (jGLi) – Jose “Onie” L. Villamor, Jr. was celebrating his birthday July 1 Sunday morning when the celebration was interrupted by the death of his father, Jose G. Villamor, Sr. at 1:40 p.m. Pacific Time at the hospital (Sharps Hospital Grossmont) in San Diego, California of lingering lung cancer. Although the death of the elder Villamor, a native of Sorsogon City in the Philippines, was expected, it was a surprise because he was able to recover from a grave condition three months ago when doctors gave him 48 hours to live. 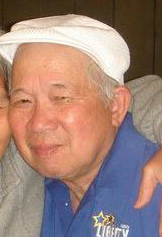 Villamor (photo), 72, an engineer by training and a college professor, was recovering and rehabbing in a nursing home (Jacob Health Care Center, also in San Diego) when he was rushed Saturday to the hospital, where he eventually died. He was the son of the late Nicolas Villamor and Concepcion Grones, both of Bulan, Sorsogon. His wife, the former Violeta G. Lariosa, a former public school teacher in Sorsogon City, told her eldest sister, Antonia L. Rey in Chicago, Illinois, that Joe was able to say, “I am ready to go. Just cremate me and take my ashes back to Sorsogon City for my other children to see.” He must be referring to Manuel, Roman, Celeste and his grand children, who were not able to immigrate to the U.S.
During the time that he was rehabbing, Joe wanted to get healthy enough so that he could travel back to Sorsogon City, where he wanted to die. He was a general manager of the government Sorsogon Tecommunications office, where he retired before immigrating to the U.S.
His other children who were with him in San Diego are Onie, Rico, Nino and Jessie, the latter two are both in the U.S. Navy. He is also survived by his daughters-in-laws, Cathy, Evelyn, Jennet and grandchildren. Other survivors include his in-laws, Antonia L. Rey (Roling), Dona L. Hernandez, Joseph G. Lariosa (Josie), Ray G. Lariosa (Angie), all of Chicago, and many nephews and nieces. Funeral services, including a mass, will be held at National City and Chula Vista Mortuary and Cremation Service at 611 Highland Avenue, National City, CA 91950 on Saturday 7 July 2012 starting at 2:00 PM.